Fighters from Islamic State (IS) have taken control of a key Syrian government airbase, activists say. The Tabqa airbase was the last remaining stronghold of Bashar al-Assad's government in Raqqa province..
State TV confirmed that government forces had "evacuated" the airbase. Days of fighting there have reportedly killed hundreds on both sides. More than 191,000 people have now been killed in the three-year-old Syrian conflict up to April, the UN says. IS, formerly known as Isis, has expanded its reach into large parts of eastern Syria and northern Iraq in recent months. The US has launched limited airstrikes against the group in Iraq but has not targeted them in Syria. The Syrian Observatory for Human Rights, a UK-based activist group with opposition ties, said clashes around the airbase were ongoing but added that the base was under IS control. Hundreds of soldiers and IS fighters had died in the past few days' fighting around the base, the Observatory said. 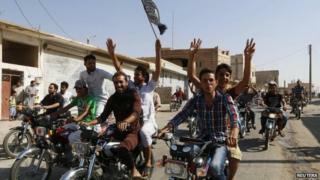 Syrian state television confirmed that government troops had lost control of the base. "After heavy fighting by the forces defending the Tabqa airbase, our forces implemented a regrouping operation after the evacuation of the airbase," it said. Government forces were conducting airstrikes on the base after the troops evacuated, it reported. One year on from the chemical weapon attack in Damascus, the war in Syria has become part of a wider regional struggle. The base lies around 45km (30 miles) outside Raqqa city, the main powerbase of IS, and is believed to hold dozens of warplanes, helicopters, tanks and artillery. Analysts say the fall of the base is a significant blow for the Syrian government's ability to project air power into the north of the country. The base was the last remaining government outpost in the province, the BBC's Sebastian Usher reports. The militants have celebrated previous victories over two other bases by displaying the severed heads of soldiers in the middle of the town, our correspondent adds. IS fighters have steadily taken over several government military bases in Raqqa province in recent weeks, including the Division 17 base just outside Raqqa town. In a separate incident, Syrian government forces killed 32 rebels in an ambush in Deraa in southern Syria, activists said. State media confirmed the attack, and said tens of fighters had been killed. Opposition groups in Syria have been fighting President Bashar al-Assad since 2011.